Perfect Paul at Defibrillator Gallery Chicago USA. Digital persona Perfect Paul presents his latest research findings on the external controlled human face as a site for artistic computational expression. 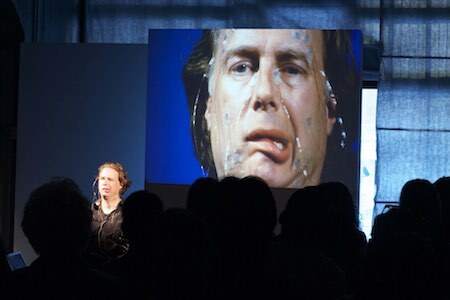 Perfect Paul –in a live show down of computer versus human facial choreographic capabilities– unveils an as yet unknown expressive potential of the human facial hardware and discusses its political ramifications. First performed at Technarte 2012 Art & Technology International Conference, where it won the Best Speaker Award.